Fortnite Battle Royale is giving players a new option to get sneaky with a silenced pistol, already live and ready to be found as you scrounge the map. 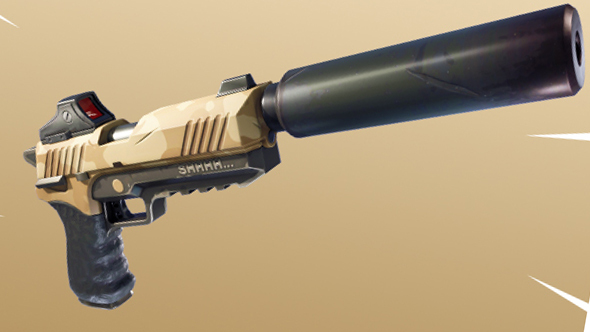 This weekend, you’ll also have the opportunity to put those quiet weapons to the test in the limited time Sneaky Silencers mode. Still trying to choose? Let’s break down Fortnite Battle Royale vs PUBG. The silenced pistol hit the game earlier today, and can be found in treasure chests, supply drops, or as floor loot. It can be found as Epic and Legendary rarity, which do 26 and 28 damage respectively, according to the developers on Reddit. It’s a progression of the basic pistol, in a similar vein to the assault rifle. Starting January 5, you’ll be able to hit the Sneaky Silencers mode, where your only weapon choices are suppressed SMGs and pistols. Traps will be disabled, and bush drop rates have been “greatly increased.” In other words, expect plenty of hot death coming from quiet bits of foliage. The Sneaky Silencers mode only lasts until January 8, an even shorter stay than the week-long 50 vs 50 mode from December. So if you want to jump in, do it quick once things start on Friday.